Songwriter and multi-instrumentalist Roy Schneider has been touring and performing full-time with musical partner Kim Mayfield since 2008. The duo is slowly working toward a new band name, with a collection of original songs on what will become an eponymous title, Reckless Saints. 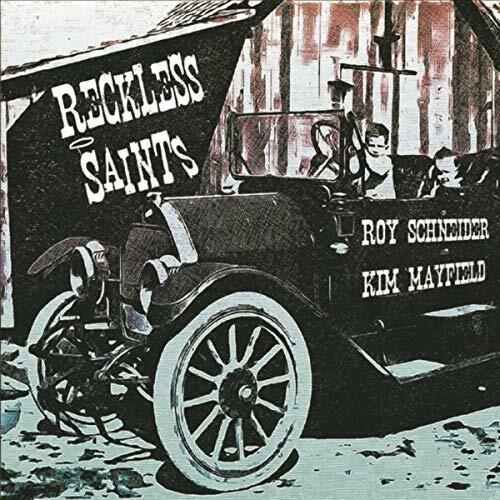 Slated to be released November 2, the 11-track album features songs by both Schneider and Mayfield, as well as a gritty cover of Blaze Foley’s “Election Day,” which features Gurf Morlix on lead guitar and contributing vocals. “This truly is a wonderful record. It is one of the finest singer/songwriter records to come across my mastering desk in a long time!” says esteemed producer, songwriter, and engineer, Mark Hallman [Carole King, Ani DiFranco and Eliza Gilkyson]. Self-produced, Reckless Saints was mostly recorded at Schneider’s studio, Shiny Gnu Records, in Fort Myers, FL. Other tracks on the album include the Dylan-inspired, “Subjugated Love,” which is a fun little ditty about love gone wrong, “Runaway Train,” a song that addresses the frustrations and lack of peace of mind resulting from living in a society that – were it a train – might appear to be running rapidly off the rails without a knowledgeable engineer, and “After The Storm,” written in the aftermath of hurricane Irma in September 2017, amidst downed trees and debris, flooding, unbearable heat and humidity, no power, mobs of the unprepared getting cranky and scary… touching on the coming-together of neighbors and friends in challenging times. In their ten years of touring, the duo has played in 40 states, Canada, England, Belgium, and The Netherlands at hundreds of venues and festivals including 30A Songwriters Festival, Telluride Blues & Brews, the Kerrville Folk Festival’s New Folk competition, Nashville’s Bluebird Café, and Roy’s appearance on NBC’s The Voice in 2013. Prior to 2008, Schneider wrote and drew a syndicated comic strip that ran for over 3 years in newspapers (still in reruns on Comics.com), as well as working a corporate job in the 1990’s designing Happy Meal toys. Music, though, remains his true calling.